While the world ignores the manger scene and the wise men, our churches organize revivals and activities around this special time of the year, to thank the Lord for becoming man and sacrificing his life for us, and to thank him for his long-suffering towards us as we struggle to live our lives in a way that pleases him. Christmas time is the busiest time of the year for our churches as we have Christmas revival services, kid's clubs, end of the year activities, and New Year's services. We took part in organizing a week of revival services for 7 of our church plants, kid's clubs in 2 churches, as well as an end of the year celebration with the radio staff live, on the air. We put a lot of miles on our Maranatha bus as different choir groups came and provided special music for these services. We were thankful to have a part in organizing these special activities. We are thankful for the help from a friend in Eastman, GA, which allowed us to purchase 5 motorcycles, the land in Jacmel, and build a church in Savanette, a small town near us in Haiti. The pastors who received the motorcycles will use them to preach, teach, and evangelize more effectively. It was fun to see the big smiles and excitement as each pastor received a brand new motorcycle. Although their spirit of thankfulness was a source of encouragement, the real joy will be in the souls reached with the gospel because of this sacrifice on the part of our partners in ministry stateside. Land Purchase for church in Jacmel - Pastor Antoinius Fils has moved from Cap Haitien to Jacmel because of his wife's health. He has already planted a church there and we are helping with the purchase of land for the new church. 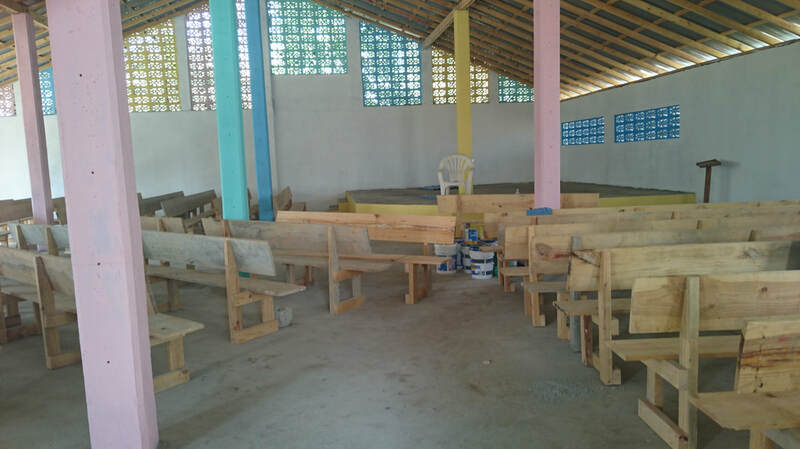 The church in Cap Haitian, Eglise Baptiste des Elus, is now pastored by Pastor Weber Carcourt, a friend of several years. One of the focuses of our ministry is training and discipleship. Our full time seminary program runs from Monday through Friday. But we also have a Saturday program for pastors and church leaders whose schedule does not allow them to participate in a full time program. Tim is teaching a class on 1 Timothy for this Bible Extension Program every Saturday through November and December. Besides the regular pastoral duties, and preaching obligations, Tim was also able to teach a two day class on faithfulness for the members of Eglise Baptiste Mahanaim, in Mathador, Dondon. We are thankful to have continued contact with our church plants. It is a blessing to see them grow. The full time seminary program kicked into full gear again this fall as Tim taught a 4 week, 5 days a week class on Church History at Maranatha Theological Seminary, here on our Wallondry campus. We were glad to be a part of the annual Harvest Revival in Cadush as well. Pastor Hector Couloute was celebrating a 6 month anniversdary of the construction of a temporary church structure. We had been meeting in a rented building, and moved across the street after building a structure made of palm tree boards. Tim preached to a group of over 100 people, many of whom were unchurched visitors. 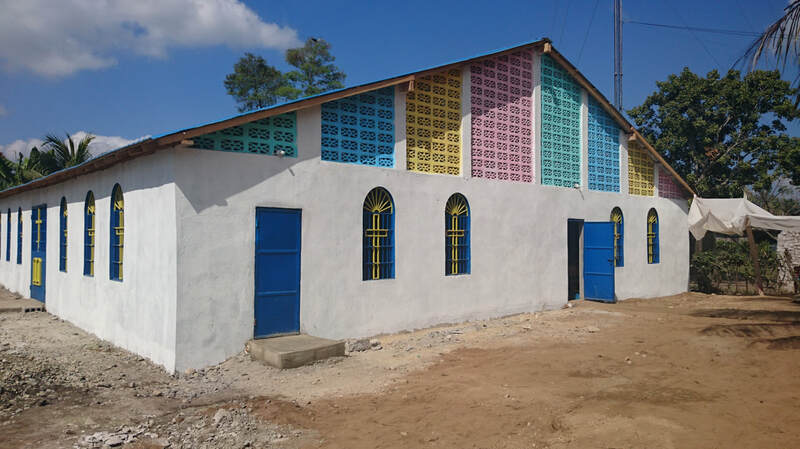 Pastor Yves Enselme, of Smyrne Baptist Church of Ouanaminthe, held his annual Harvest Revival in September to mark the one year anniversary of the construction of the church building. We helped to build the church in February 2016 and were glad to be part of the anniversary. Tim was privileged to preach the final service on Sunday Morning. Over 700 people were in attendance. Our twins, Michael and Samantha, graduated from High School this past June. They decided the Lord want them to attend Pensacola Christian College in Pensacola, FL. Lloyd and Joshua, our oldest kids, are at PCC as well and will help make the adjustment a little easier. We went back stateside for the summer to help the kids find jobs and figure out how they are going to work through college. They are not afraid of hard work, but growing up in a third world country speaking French and Creole has them a little out of their element. The United States is a foreign country to them. Pray for them as they struggle to adapt and make friends and that the Lord will provide for our four children at PCC as they work hard to pay their own way through school..
Tim is continuing working on his doctorate degree at Maranatha Baptist University. As the seminary administrator and professor in Haiti, he needs to continue his education for the long term benefit of the ministry. He will be taking two courses this summer which will leave four more classes to complete the program. We came came back to the States for the summer, after the twins finished their last high school classes and graduated. With two children already in university and two just coming back from a lifetime in a third-world country to go into university, there are a lot of adjustments and preparations to be made. Tim's is taking advantage of the summer stateside to continue working on his doctorate. He is also working on several major projects like publishing several Creole Bible study books on Kindle, upgrading our ministry website, studying French, and continuing to do translation work. Mike ans Samantha just graduated from High School! They are excited and scared at the same time. They are really sick of school, but they found out quickly that graduating from high school is not the end of school. They had "Commencement Ceremony" at a school in Florida to celebrate their graduation. It's funny, the word "commencement" in French is "beginning." And graduation is the beginning of another stage in their life. Samantha and Mike are going on to Pensacola Christian College to join Lloyd, a senior, and Joshua, a junior. Pray for our four older children as they are working hard this summer to pay their way through school. Our church on campus, Maranatha Baptist Church is celebrating it's annual Harvest Revival. Pastor Edris Damitas from Cap Haitian is our guest speaker for the week. Pastor Markelito's church in Savanne Bourg, Faith Baptist Church, as well as Pastor Eliphene and Pastor Guillot's church in Garde Biassou, Calvary Baptist Church, are celebrating their harvest revival services this month as well. Pray for these churches, that the Lord will use this time to bring real old fashioned revival to the hearts of his people in Haiti. Pastor Frisnel has stepped down as pastor of Shekinah Baptist Church in Bassin Caiman. Pastor Jasmin Pierre, who was working with Daniel Sidalmé in Mathador has taken over the position as pastor there. His age and ministry experience are a godsend as he begins working with this broken church. Pray that the Lord brings healing to his people amidst discouragement. God has also provided the means for us to purchase a motorcycle for Pastor Jasmin, so that he can do the work of the ministry in this difficult moment. Pray for the other ministry activities this month: for Jean Prophete, as he continues to show the Jesus Film in hard to reach areas; for Constance Pierre, a young seminary graduate who is providing a counselling role for a struggling church in Port au Ciel; and for the Ladies College Exposition, as this year's graduates display what they have sewn throughout the year. (2017-April) Bible Seminar with 168 people ! As the school year takes an Easter break, in the middle of our spring semester, we take time to celebrate the death, burial, and resurrection of our Lord and Savior. Our Easter revival was once again accompanied by another week long Bible seminar. This seminar was a study of the book of Hebrews, and we had 168 people attending, not counting the support staff, teachers, and pastors. We also had several groups from distant churches that stayed on campus that we were preparing three meals a day for. All in all, we prepared over 2200 meals for the program, but the spiritual nourishment received far outweighed the physical! The children's church ministry never makes the news. RoseAnne, Mrs. Baker, and our children work tirelessly with the children here at Maranatha Baptist Church in Wallondry. There are normall over 80 children every Sunday morning. The activities, riot control, and Bible lesson make for a tired body after church. But, each of these children hears a clear gospel message every Sunday. It's hard to say how many hundred children have accepted the Lord as a result of this ministry. The semester is continuing on as normal at the seminary. Throughout the month of March, Tim taught a class on Religions, Cults, and Denominations. The Monday after the construction in Ouanaminthe was completed, Tim began teaching his four week seminary class on the Gospel of John. Every year durin Mardi Gras, we organize a Youth Retreat to divert the attention of the young people in our church away from the drugs, drinking, and immoral activities that are traditionally a part of the Mardi Gras festival. 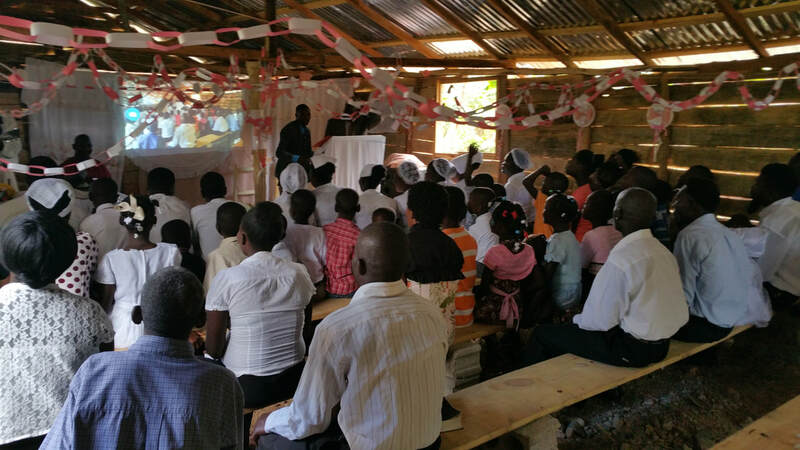 This year, 65 of our young people went to Pastor Yves new church in Ouanaminthe. Yes, that is the same church we just finished building. They were eager to see what the Lord has been doing there, as well as to take part in several days of evangelism to give this new church a "shot in the arm." Pastor Yves Anselme is pastor of a church in Ouanaminthe, a large city on the northern border of Haiti and the Dominican Republic. For the past year, Pastor Yves has been meeting with his church in a makeshift structure covered with a few pieces of rusty tin and a torn tarp. In rainy weather, they would simply get wet while trying to hold services. It was our pleasure to team together with Colonial Hills Baptist Church, Lloyd Gordon, and some friends from our supporting churches in Canada, to build a 60 ft square church building for Pastor Yves and his church. What a blessing to see the church go from the foundation up, to be completed in less than 10 days. Pray along with us that this church is a lighthouse for the gospel of Jesus Christ. Unit #1066-FBM, 3170 Airmans Dr.